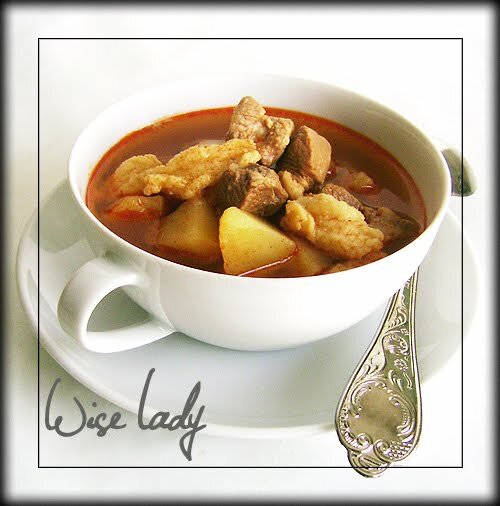 Almost the most classic Hungarian soup: Gulyásleves. Word-by-word translation: ”cowboy soup”, but let’s call it simply Traditional Hungarian Beef Soup with Paprika or Goulash-soup. This recipe presents the traditional version. You can prepare it with more vegetable, too. Dice meat into 2x2 cubes. Cut onion and garlic into small pieces. Heat fat in a big pot, add onion and garlic, cook until they turn a little transparent, then add meat and fry until it gets white. Now pour some water on meat to cover then add tomato and green pepper. Put top on and cook until the meat is soft and the onion simply disappears. Do not use too much water: add some only if liquid gets too low. Just before meat is done, sprinkle paprika in, stir thoroughly, and finally pour some more water to get a nice soup-texture. Add diced potatoes, salt, cumin and celery, and cook until potatoes are soft. As a last step, throw „csipetke” in and let the soup boil for one more time. If you wish, you can add sliced carrots and parsnips some time before you add potatoes. This will not make the soup less authentic- it is only another variety. Get started with the csipetke only if it’s needed immediately. Do not let the dough stand! Pour flour into small bowl. Add salt, egg, some drops of oil. Do not stir it smooth! Mix ingredients only roughly. The dough should not be too stiff. Cover your hands with flour. Roll dough into long, one finger wide pieces and pinch one-bite-sized bits into boiling soup. The csipetke is done when it starts to float on top of soup. One minute should be enough for that. Well, though the soup is really good looking, but those csipetkes are not quite csipetkes, more like huge csipets. :) But it truly looks delicious.